This epic historical compilation, a 4-CD boxed set, contains the complete recordings of all compositions and arrangements by Grammy-nominated composer Neil Slater written for and recorded by the UNT One O'Clock Lab Band, plus a Grammy-nominated tribute. 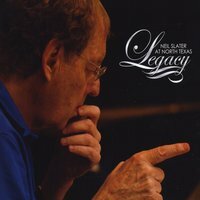 Legacy—Neil Slater at North Texas is the newest release by the North Texas Jazz record label at the University of North Texas College of Music. The 4-CD boxed set contains the complete recordings of all compositions and arrangements by Grammy-nominated composer Neil Slater written for and recorded by the UNT One O'Clock Lab Band, plus a Grammy-nominated tribute piece composed by Rich DeRosa, 38 tracks in all. A 160-page book is included as part of the boxed set, featuring hundreds of photos and notes by band members, colleagues and friends. This landmark historical compilation honors the legacy of Neil Slater, the longest-tenured director of the world-renown One O'Clock Lab Band.